Are you looking for a garage specialising in MOTs in Brockenhurst? Perhaps your car has been in a scrape and needs repairing? If so, don't hesitate to get in touch with the professional team at Brockenhurst Garage Services Ltd, you won't be disappointed with the services we provide. 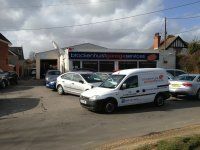 Based in Brockenhurst, customers come to us from the surrounding areas and beyond to take advantage of our quality garage services. At Brockenhurst Garage Services Ltd we have over 15 years of experience in the industry and during this time our reputation has grown from strength to strength. For your peace of mind our mechanics have fully served apprenticeships and they are VOSA approved. For quality garage services in Brockenhurst phone us today and book our services. Alternatively, you can get in touch with us by clicking on the 'Contact Us' link and send us a message, one of our team will get back to you as soon as possible in regards to your enquiry.